A large tree of the prairies reaching a height of 80 feet or more and a trunk diameter of 5 feet, with a short body and heavy branches that form an open, spreading crown of dark green foliage. Occurs on limestone soils in Central Texas as far west as Tom Green county, often on rich bottomlands along streams or hillsides and banks along spring-fed rivers. Also planted widely as a landscape tree throughout Texas. Simple, alternate, 6" to 12" long and 3" to 6" wide, with 5 to 9 highly variable lobes that lack bristle-tips; lobes are divided by at least one pair of very deep sinuses, and the upper one-third of the leaf typically has a roughly-toothed or weakly-lobed margin. Separate male and female flowers appear in spring on the same tree. Male flowers borne on a yellowish catkin 4" to 6" long; inconspicuous female flowers reddish in color. An acorn, requiring a single season to mature, 1" to 2" long, ovoid, set deeply in a mossy-fringed cup that gives the species its common name. Twigs and branches are thick, developing conspicuous corky ridges after the second year; bark is light gray, rough and breaks into small, narrow flakes on young trees, then develops very thick bark with deep fissures and narrow plates. Heavy, hard, strong, tough and durable; used for lumber, crossties, and fuelwood. 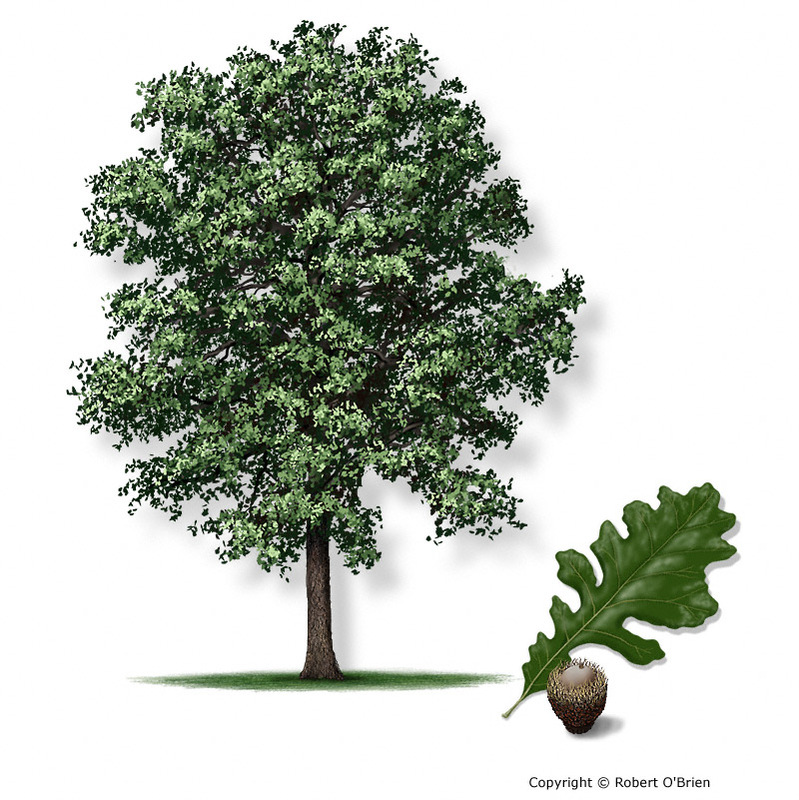 White oak (Quercus alba) is found in East Texas and has smaller acorns without a fringed cup. Acorns are prized by wildlife and can be used to make a coarse flour.